These brilliant bins help your fresh foods last longer with closable vents and trays for water. The scene in the fridge was bleak: Lettuce was limping, and the strawberries were feeling a little fuzzy. 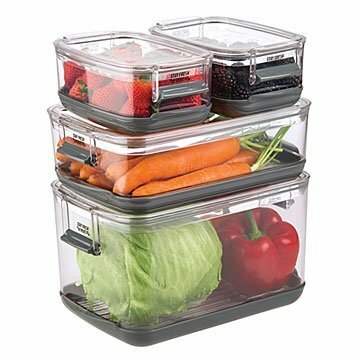 Until they piled into this set of four containers, which are scientifically designed to help extend the life of your fruits and veggies. Each one has a slotted bottom—which doubles as a colander for rinsing—over a removable tray that can protect produce from sitting in standing water, while also holding some water to help out humidity-loving varieties. The sides of each container have closable vents, so you can control the flow of fresh air. And a handy chart is printed on each lid to remind you exactly what conditions each variety of produce prefers. Made in China. I love these containers. I love how there are instruction on the covers on which vegetable to store in them. PERFECT! It really works, everything last longer now. I clean my vegetables fresh from the store. Place them in these bins in clear view. Use daily for snacks and meals- veggie omelets, hummus and carrots and celery snacks, lunch salads, and dinner sides! Easy to get my quota of vegetables and not waste a thing!! Love the quality of the containers. Great product, fruits are lasting longer. I hate having to compost produce that I haven't been able to use before it's gone bad. These containers are great and help me avoid that - clear markings on the tops for what you should add water to and what you shouldn't. For things like strawberries, rinse them before storage but don't hull them or they'll get moldier faster.